If you want to learn more about henna tattoos, an interview with an expert henna artist is an unbeatable way to gain knowledge and indispensable tips. Flavia McQueen, artist and manager/retail supervisor of Henna Caravan, talks about the exciting world of henna tattoos in this LoveToKnow interview. Temporary tattoo designs are a popular body art style that allow freedom of expression without long term commitment. 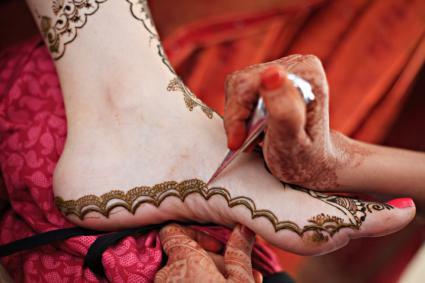 Whether to celebrate a special occasion or rite of passage, the use of henna dye is quickly regaining in popularity. LoveToKnow (LTK): Could you tell us a bit about the tradition of henna and how it has transformed into a popular body art? Flavia McQueen (FQ): Henna has been used down through the ages for thousands of years. Inscriptions place henna in use in Syria as early as 2100 BCE and in the Greek Islands from around 1700 BCE. Henna has usually been utilized with cultures that have a history of Goddess worship. Henna was relatively unknown ten years ago, and it has become more popular with women here in California and around the world. The art of henna is amazing, and now it can be embellished with jewels and glitter to make it sparkle and coordinate with your clothes. Women of all ages use henna for celebrations, and the art has improved and become more popular than ever before through word of mouth and the Internet. LTK: What exactly is henna dye, and what are the ingredients? FQ: Henna is the Persian name for a shrub known scientifically as Lawsonia Inermis. It is harvested twice a year, dried and ground into a fine powder. The powder is used to dye hair red and for the ancient eastern art of mehndi. The hennatannic acid is a natural safe vegetable dye that bonds with the collagen in your skin cells and the keratin in the hair leaving a lovely color. LTK: Is henna dye available in different colors or levels of intensity? FQ: Different colors or levels of intensity are achieved in several ways. Henna can be steamed on the skin to darken it, or it can be left on for different lengths of time to get darker and lighter stains. Henna will be a shade of red/brown . There are no other safe dyes and henna does not come in black or blue. LTK: Should you test for an allergic reaction prior to applying henna dye to the skin? FQ: You can test for henna sensitivity although it is extremely rare. If you use 100% natural henna mixed with safe oils and lemon juice, there is little to no chance of an allergic reaction. If you suspect a henna allergy, please do not apply the henna and be sure to also test for citrus allergies. LTK: Even though henna art is temporary, how long should the tattoo last? FQ: Henna typically lasts seven to ten days. However, it can last longer than that depending on several variables such as where the henna is placed on the body, how long the henna is on the skin, if the skin is clean, and if the essential oils and henna are good quality. LTK: Could you explain the difference between Indian style designs and Arabic style henna? FQ: Indian styles of henna are usually filled with lacy paisleys or flowers and everyday shapes from daily Indian life such as the mango and the peacock. Arabic style is usually a large floral that will have more open space, and the designs will not have a motif like faces or peacocks. Both styles of henna are amazingly beautiful. LTK: Is it easy to apply henna yourself? What's the process? Fill your applicator, clean the skin and you are ready to begin. After the paste is applied, leave the henna on the skin for four to six hours and scrape it off leaving the dyed skin. The stain will continue to darken over the next 36 hours, and you will have great henna. LTK: What tools and implements are needed to create a henna tattoo? FQ: You can use a hand rolled cone, a jacquard applicator bottle or other bottle to apply henna. Henna has been applied with sticks, rolled into strings and pressed on the skin, taped areas or stencils and paintbrushes may also be used. LTK: Are there any starter kits that are a good investment for a beginning henna artist? FQ: I think the Henna Caravan kit is a perfect beginner kit. It comes complete with everything you need to have a successful henna experience - bottles, premium henna, wonderful essential oils and all the tool and tips and patterns to get you started. The jacquard bottle is easy to refill. LTK: What rituals or occasions are most popular for henna art? FQ: In our experience birthday parties are most popular for every age along with graduation parties and Bar/Bat mitzvahs, Blessingways are also great fun and so relaxing for everyone. LTK: Summer is a great time of year to flaunt a henna tattoo. If someone is on the fence but wants to experiment with their first henna design, what's your favorite placement and artwork style? FQ: Get something you like whether it is flowers or skulls or geometric patterns, and put it on your ankle or up the leg. If you want more, just repeat the pattern, make three flowers instead of one, so it flows on the body. Flavia is a passionate designer of Henna tattoos. She shares how her love for the art form began: "Our family has always been interested in the arts and travel, so it was a natural progression from decorating cakes and gingerbread houses to art degrees and henna." For more about Flavia McQueen, or Henna Caravan, visit the website at: www.hennacaravan.com. Learn more about the art form, artists, view the company's portfolio, or book an appointment.